In case you haven't heard, I sprained my ankle. It was 2 weeks ago when I took my son and his friend down the slide at a pumpkin patch. We went down so fast that I couldn't stop in time and rolled my ankle at the bottom of the slide. Not my favorite moment. 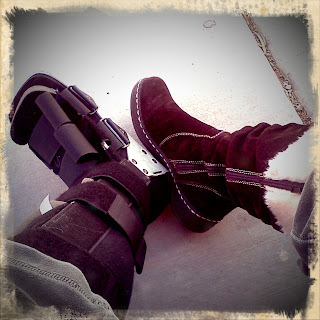 Ever since then, I've been wearing a fancy bionic boot...or at least that's what my husband and I call it. The Toddler runs around saying, "Mommy has an owie leg." And then he leans down and kisses my boot....when he's not feeling ornery. When I was a kid, I used to fantasize, yes fantasize, about how awesome it would be to have an injury that would require crutches. Since then I have gotten over that foolish fantasy. I hate/love the fact that I need to stay off my feet as much as possible. Since becoming a mom a couple of years ago, I long for the time when I can recline on the couch all day and do nothing. But now that I HAVE to do this, I find it very boring, and frustrating. I have so many things I want to get done, but shouldn't be doing. Wearing the boot, brings me to a new level of frumpiness, that I have never before achieved. When I stay home for the day, I wear sweats and boots. (Maybe I should say A Boot). Yes boots. Because a boot with my bionic boot, it keeps my foot at the same level as my foot in the bionic foot. Otherwise, it feels like you are walking with only one heel. Very uncomfortable. Since I look so frumpy at home, I really try to make the effort to look nice when I go out of the house. However, the bionic boot really takes away from my outfits. ;) After I would get dressed in the morning, I would walk downstairs and show my husband and say, "Fabulous!" (referring to my outfit). Now I walk downstairs and say "Almost Fabulous." Ha. I only wear my right shoes these days. (for obvious reasons). I have a pile of right shoes at the foot of my bed. Because that's where I take them off before getting into bed at night. I believe I might have a hard time finding the matches to each of my shoes once I don't have to wear the bionic boot anymore. I feel incredibly dumb telling people how I sprained my ankle. Especially the part about going down the slide. Believe it or not, I really, really, really miss exercising. I feel so tired and sluggish when I don't exercise. Blah. I'm also really sad that I'm missing great cycling weather. This makes me really sad. I've actually considered trying to cycle with a sprained ankle, but I decided that would not be a good idea. Ha ha. I've been letting The Toddler watch waaay more TV than he should lately - to keep him occupied while I rest. I feel so guilty about it. I think having an injury and walking around with a heavy bionic boot all day must make me extra tired, because I have been sleeping way more than usual. 2 weeks down, and 4 more to go. This feels like forever. So, I googled "wearing a boot" and "sprained ankle" and came across your blogpost. I love your writing style! And, you are far more stylish with a boot than I am! I actually broke my right ankle and sprained my left ankle on Sunday. So, now I am casted on the right and wearing a boot on the left... Just curious, did you wear your boot at night? I just don't see it being very comfortable, but if I need to do it to heal, I will. And, by the way, I broke and sprained my ankles walking downstairs to get the mail, so I know how it feels to wish you had a better story about how your injury happened. I usually offer very little info and let people draw conclusions, LOL! Elizabeth, I think it's hysterical that my blog came up when you googled boot! ha ha! It's really awesome that you thought I was so stylish with the boot. But honestly, I felt like a giant dork the whole time!! So sorry to hear that you broke and sprained your ankles!! That's crazy. I did not wear my boot at night. It was way too bulky for me when sleeping. 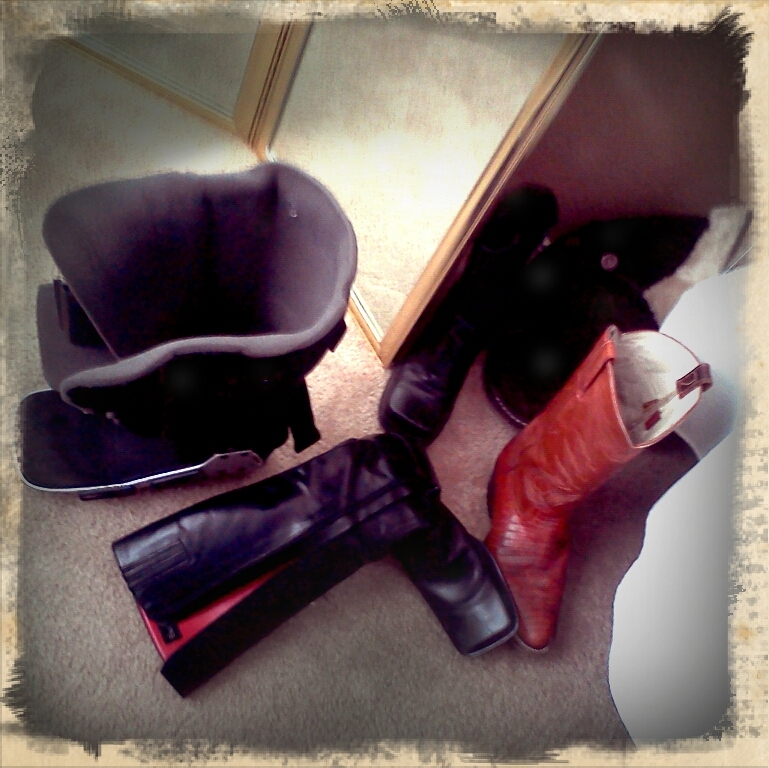 As long as I wasn't moving around and either in bed or on the couch, I avoided wearing the boot. I think it's totally cool that you don't explain how it happened. The less info, the better. I would do the same thing! My ankle has healed now, but I did have to go through a couple of physical therapy sessions in order to recover. Your choice of the ankle/foot was not the best choice ... unless you chose this topic because you are an overachiever! I can try and help you the best I can. Thanks James, you are very thoughtful. I actually sprained my ankle about 2 years ago. I ended up going to see a foot specialist who gave me a different type of ankle brace and sent me to physical therapy. After I finished physical therapy, my ankle was great and I haven't had a problem since then.